Check out the results of the PBA Philippine Cup Game 2 Quarterfinals of the Barangay Ginebra and the Magnolia Hotshots. 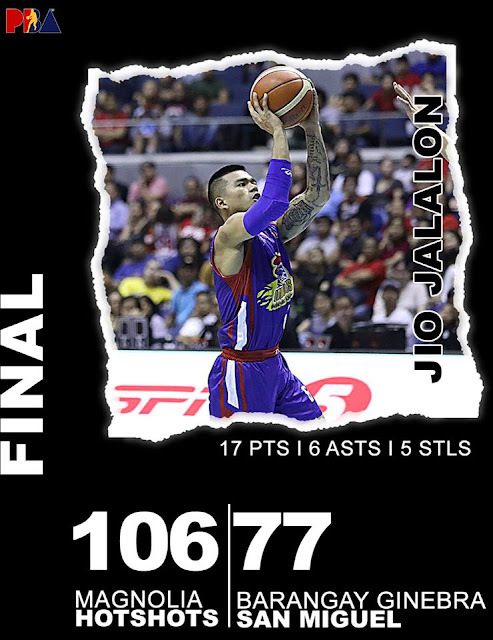 The Hotshots easily win the game 2 of the quarterfinals, led by Sangalang who scored an almost double double 21 points and 9 rebounds, Jalalon added 17 points, 6 assists with 5 rebounds and also Barroca and Lee added with 13 points. The Series are now tied 1-1 and they're going to the do-or-die game 3 on April 10, 2019 at the Smart Araneta Coliseum. Magnolia 106 - Sangalang 21, Herndon 18, Jalalon 17, Barroca 13, Lee 13, Dela Rosa 11, Ramos 6, Abundo 3, Reavis 2, Brondial 2, Gamalinda 0, Melton 0, Pascual 0. Ginebra 77 - Mercado 13, Thompson 8, Ferrer 8, Dela Cruz 7, Caperal 6, Teodoro 6, Tenorio 5, Aguilar J. 5, Slaughter 5, Chan 4, Devance 4, Mariano 2. Quarters: 25-18, 51-38, 81-54, 106-77.